If you use Google or Google Scholar to find articles, or look at journals online from their publisher’s websites, you have probably run into times when the website asks you to log in or purchase the article in order to download the full text because it is subscription-only. University Libraries pays for subscriptions to thousands of these online journals, but it is very cumbersome to have to go to the Libraries’ home page, go to our journal list, find the journal by title, log in, link to the journal’s website, and then search for the article you wanted to read. That’s why we developed JournalPass! JournalPass is a bookmarklet that works with all four major browsers (Chrome, FireFox, Internet Explorer and Safari). Merely visit our JournalPass LibGuide and install it with the one you use most. Then the next time you are off-campus and get to a login page on a journal publisher’s website, click on JournalPass in your browser bar. You will be prompted to log in, the journal website will recognize BGSU’s subscription, and you will be able to download the article. JournalPass was developed at BGSU by Dave Widmer. It’s the #1 most frequently asked question at the Research & Information Desk at the start of every semester. To find out if you can get your textbooks at the library, follow the steps below. A new window will pop up, taking you to the bookstore. You will need to click the green button to do comparison shopping. The books for your course will appear in a list on the left side of the screen. 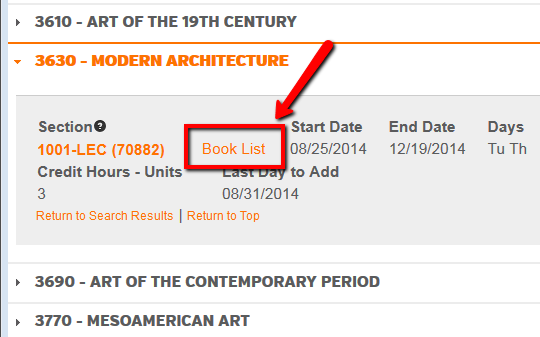 To see if we have the book in our collection for checkout or if it is in OhioLINK, searching by ISBN is more effective. An ISBN search is the best way to find the EXACT EDITION you need for your class. Copy the ISBN of the book from the list in the bookstore’s website. Go to the library’s home page and paste the number into the Summon search box. If our library owns the book, you will be able to see its call number and where it is located. If no results are found, click on the “Search OhioLINK” link at the top of the screen. 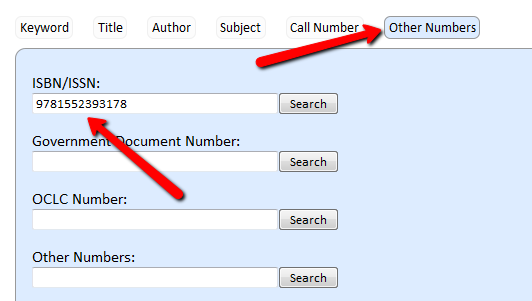 Choose the “Other Numbers” search and paste your ISBN into the first search box. 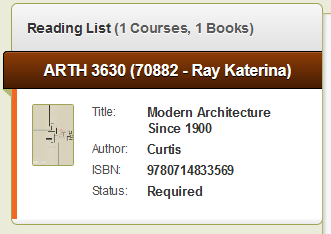 If the book you need is available in another library, click on the green “Request” button and use your BGSU username and password to request it. 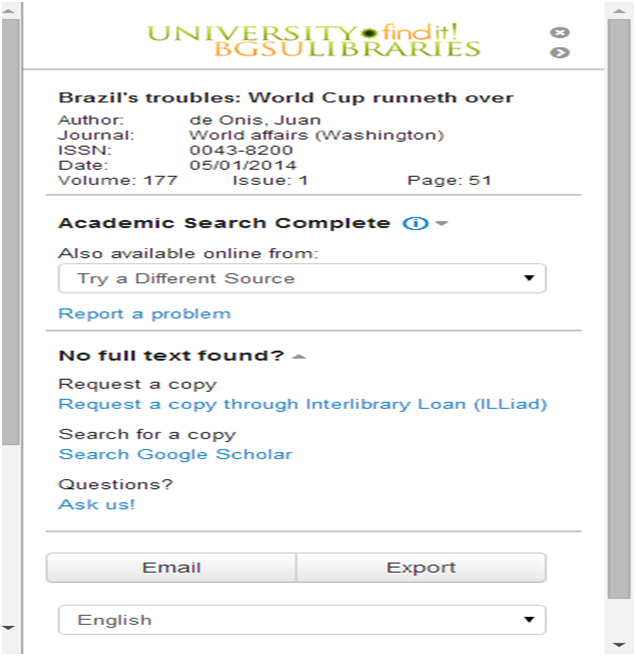 If your book doesn’t have an ISBN, or you want to see if an older edition is available, use the Summon or OhioLINK advanced search screens to search by title and author. If you can find one of your books from the library or OhioLINK, you will not be able to keep it the entire semester. You may need to photocopy or scan a chapter, then return the book, or you may need to re-request it. You may find it more convenient to buy the required books for some of your classes even if you can check them out from the library. As always, if you have questions, Ask Us! 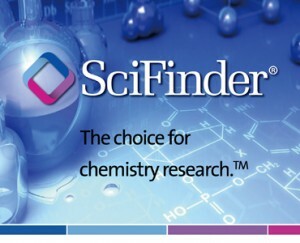 SciFinder provides access to the world’s most comprehensive and authoritative source of references, substances and reactions in chemistry and related sciences. Use it to search for substances, reactions, and patent and journal references anytime, anywhere. BGSU’s subscription allows for unlimited simultaneous users. To use SciFinder, you must first sign up for an account with your BGSU email address using this link: https://0-scifinder.cas.org.maurice.bgsu.edu/registration/index.html?corpKey=569FF115X86F35055X5DF47EB620EAA54340 This link will only work with Chrome, Firefox and Safari – not with Internet Explorer. If you had an account at a former institution where you were a student or faculty member, you should re-register for SciFinder through BGSU. If you had any saved searches or alerts associated with your former account, you will need to re-create them in your BGSU SciFinder account – there is no way to transfer them. SciFinder is listed on our All Databases page under “Sciences” – go to the Libraries’ Home Page –> Search & Find –> All Databases. Looking for a federal law? Because it generally takes several years for individual laws to be added to the Statutes at Large, HeinOnline U.S. Statutes at Large provides a link to FDsys which includes the full text of public laws that have not yet been published in the U.S. Statutes at Large. This database also includes earlier Federal Codes and Compilations of Statutes. The database allows users to browse by Congress, year of enactment, popular name of the law, Indian treaties, or other treaties. It also allows for searches by public law number, Statutes at Large citation, name of tribe or nation (for treaties), phrases within laws, etc. If you have questions or wish further information about HeinOnline U.S. Statutes at Large, contact Carol A. Singer, Professor in the Library Teaching and Learning Department at singerc@bgsu.edu or 419-372-9412. 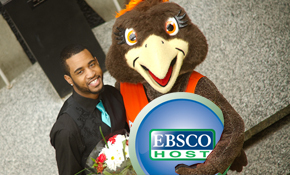 Get the most out of EBSCOhost! You’ve probably used EBSCOhost, but how much do you really know about it? Did you know you can search in a database just for art? That EBSCO can format citations for your bibliography? That you can do cited reference searching, save search and journal alerts, and explode numbers of search results by searching within full text? Here are some tips on these and other things you might not know about EBSCO, so you can get the most out of it this fall. Use subject-specific databases. If you click on the EBSCO link on the library’s home page, you will be searching a database called Academic Search Complete. While it is EBSCO’s biggest database (with over 8,000 full-text journals), it is far from complete! Use the “Choose Databases” link above the search box to get to the full list of over 70 databases the library has from EBSCO, and be aware that searching Academic Search Complete does NOT search them all! Hover the cursor over the dialog box next to each one to read its description, then choose the ones that best suit your research needs. Format citations. When looking at the description of an article in EBSCO, you will see a list of “tools” on the right side of the screen. One of these is “cite.” If you click on this, EBSCO will make a citation you can paste into a bibliography. Just choose the format you need! Also useful are the “email” and “permalink” tools – the latter generates a url that will get you right back to that article from on or off campus. Save search alerts. If you create a “My EBSCOhost” account (using the “sign in” link at the top of any EBSCO screen), you can save search and journal alerts, which will automatically send you an e mail whenever new content from a particular journal is added to EBSCO or periodically execute a particular search and email you the new results. This is a great tool for graduate students, so you can always stay up to date on the latest publications in your field! Watch these 2-minute YouTube videos to learn how to set up journal and search alerts. Advanced search options. 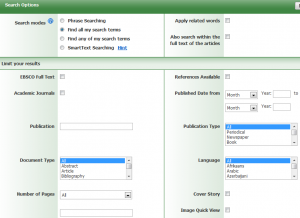 If you choose “advanced search” underneath the EBSCO search box, you will find a lot of powerful search options! You can also limit your searches by date, availability of full text, scholarly publication status, language, and more. Cited reference searching. While Web of Science and Scopus are the best sources for cited reference searching, you can also search for articles that cite a particular book or author in EBSCO. Click on “Cited References” at the top of any EBSCO screen and fill out the information for the reference you’d like to see cited. Image of Frieda Falcon and Torrance Nowden from Centennial Memories. The database LexisNexis changed its searching interface on December 23. “The bold red Academic Search box shown above is now the unmistakable place to start research. 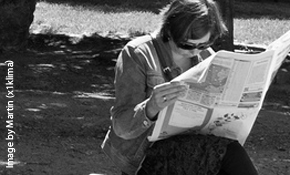 “The Academic Search box defaults to a combined search of news, business, and legal content. In the current version of Academic, a large content search like this would typically return a ‘Your search has returned over 3,000 documents’ message. The new interface will automatically return the 1,000 most relevant documents that meet your search criteria. Learn more about the new interface here, or watch this introductory video. In addition, L-N released new Curriculum-Based Research Guides – five downloadable guides covering common legal, news, business, political science, and first-year writing assignments. On Thursday evening, February 27, 2014, from 10:00pm to 11:00pm, OARnet will be doing maintenance on the switching infrastructure at the Kinnear Road center. OhioLINK has warned us that it is extremely likely that we will lose access to OhioLINK services during this time. This includes the OhioLINK Catalog, the Electronic Journal Center, the eBook Center, the Digital Resource Commons, the Electronic Theses and Dissertations center, and the OhioLINK web server. Vendor databases hosted on their systems should not be affected.